Length: 4 hrs. 56 min. A. W. Tozer earned a legendary reputation as a prophetic voice, and he continues to be a best-selling author half a century after his death. A preacher at heart, he found his greatest joy in Practicing the Presence of God. Worship was his focus and his passion. His sermons were such a strong declaration of what he discovered during private prayer and worship of the triune God that he had both the ability and the Spirit’s anointing to move his listeners to wrestle with what God was saying to the Church. His writings carry the same message with the same result to a new generation of worshipers. The Purpose of Man is the perfect introduction to Tozer. Drawn from messages he called his best teaching, this audio book will also delight those already familiar with, moved by, and changed by his other classics. 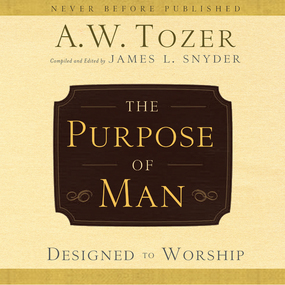 What Tozer offers on the subject of worship here in The Purpose of Man will challenge you to reconsider your life’s priorities, while at the same time holding out a cup of Living Water for your soul.